In my household, cleaning the tile floors is one of those chores that’s always pushed back to the point where it never happens. Instead of procrastinating, it’s time we all do something about our dirty tile and grout. As you go through this article for homemade tile cleaner, you may find a recipe that will do the trick. Whether it’s just mud and spills, day-to-day life, or you’re looking at months of hard water or soap scum build-up, these problems won’t cause you any worry with these cleaning recipes. By using ingredients found around the house, you can create cleaning products that, with a little elbow grease, will become cleaning solutions that will get your tiles looking brand new. A great solution for treating smaller spots, or if you’re looking for another natural cleaning step to help brighten up your house, is baking soda. Fill a bowl with some baking soda and use a damp sponge to pick some baking soda up to scrub at the stubborn spots on the ceramic tile. If you have some particularly stubborn spots, scrub with an old toothbrush for a little extra help. Rinse the area with warm water. One of the most diligent of all natural cleaners, white vinegar will keep those floors looking bright. It also kills any mold or mildew, making it a doubly effective natural tile cleaner. Mix equal parts water with distilled white vinegar and then transfer to a spray bottle. Spray the vinegar mixture onto your tile and let it sit for a few minutes. Scrub away at the floor and then wipe it dry. This white vinegar floor cleaner recipe is similar to others that teach you how to clean porcelain tile floors. If you want the acidity of white vinegar, but you don’t want to put up with the pungent smell, then try this lemon juice scrub instead for one of the easiest homemade cleaners. Mix the equal parts in a bowl. Using a sponge or old toothbrush, scrub at the floor. Rinse or wipe down the area with some warm water afterward. 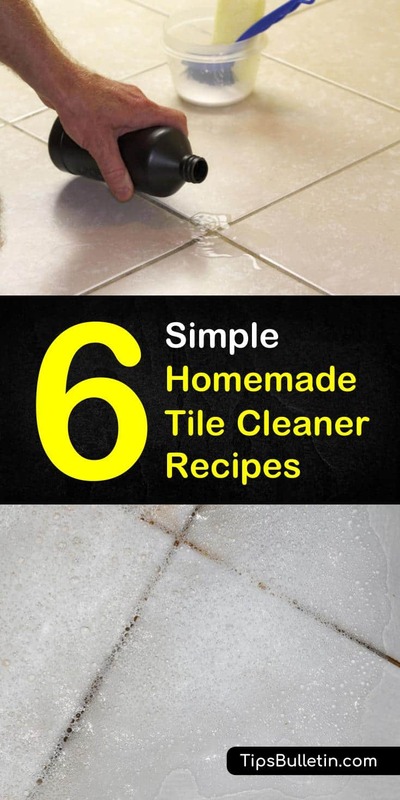 If you’re also looking for a good tile grout cleaner recipe, this lemon juice recipe is similar to some of the best homemade grout cleaner recipes. Liquid dish soap is one of those versatile cleaning products. So it’s not a surprise that you can also use dishwashing soap, like Dawn, to make a homemade tile cleaner. Pour the ingredients into a sprayer and shake. Spray the mixture on the area you want to clean and let it sit for at least 30 minutes, then rinse with hot water. The dish soap makes this spray effective against soap scum build-up in the shower. This floor cleaner recipe is also an excellent option to use as a general shower cleaner. Learn about other homemade daily shower cleaner recipes and see what best fits your lifestyle. If you have some problematic stains that do not want to come off, you may need a more intensive approach with this overnight DIY tile cleaner and tile grout cleaner. Mix ingredients until you get a thick paste. Once you have the right consistency, evenly spread a thin layer over the tiles you want to clean. Cover in plastic wrap and let it sit overnight. Clean up the paste the next day with cold water. This also makes a great tile grout cleaner. 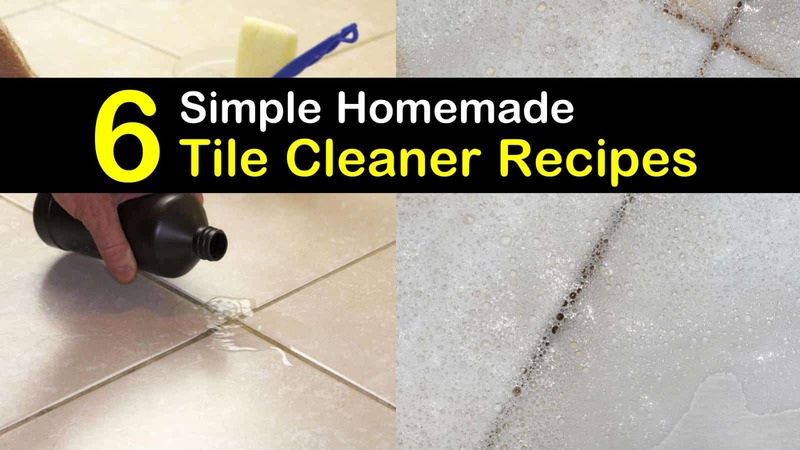 This homemade tile cleaner recipe is filled with a lot of the individual ingredients from other recipes in this article, so if nothing has done the trick yet, this one might be worth trying since you will get that combined power. Combine the ingredients in a bucket or large bowl, the vinegar, and the baking soda will fizz. Dip a sponge or rag into the solution and scrub the section that you want to clean. Rinse the area with some warm water or a damp rag. Hopefully, you found a few recipes and tips to help keep your tile floors looking clean and bright. Having clean tile and grout can make your kitchen or bathroom look like new. Everybody deserves that clean feeling, so if you liked this homemade tile cleaner article, please share these DIY cleaning recipes with your family and friends on Facebook and Pinterest.